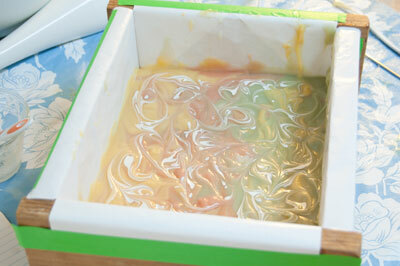 Check out this citrus scented mango butter soap recipe! In addition to mango butter, it's filled with other wonderful skin loving oils like shea butter, avocado oil, olive oil, castor oil, and coconut oil. Essential oils of lime, ylang ylang, clary sage, bay, lemongrass, cardamom, clove bud and patchouli round out it's fresh citrus scent. Copper, emerald and white mica along with yellow oxide give the soap it's soft pastel shades and Kaolin clay has been added to fix the scent and add slip to the soap. To top it off, I added a little bit of a white mica oil swirl. 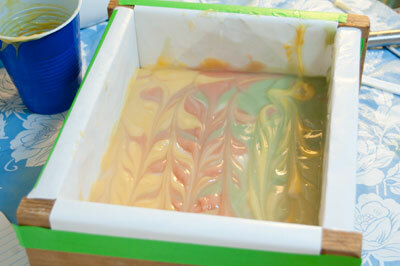 With this recipe, I cut the soap into 12 bars, each weighing approximately 100 grams when cured. The size of each bar is 2.25" x 2.25" x 1.25". Lye - 124.24 gr. | 4.38 oz. 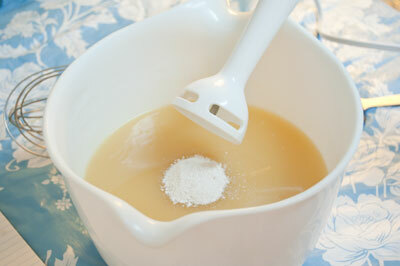 Kaolin Clay (Cosmetic White) - 2 tsp. White mica - 1/2 tsp. Copper mica - 1/4 tsp. Emerald mica - 1/4 tsp. Yellow Oxide/White mica mix - 1/4 tsp. Clary Sage E/O - 1/2 tsp. Bay E/O - 1 tsp. Lemongrass E/O - 1.5 tsp. Ylang Ylang E/O - 1/2 tsp. Lime E/O - 6 tsp. Cardamom E/O - 1/4 tsp. Clove Bud E/O - 1/4 tsp. Patchouli E/O - 1/4 tsp. White mica - 1/4 tsp. Olive Oil - 1/2 tsp. 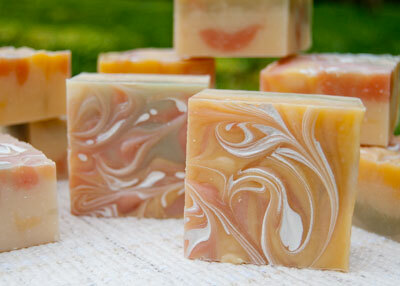 This mango butter soap recipe was made using the room temperature method of soap making. 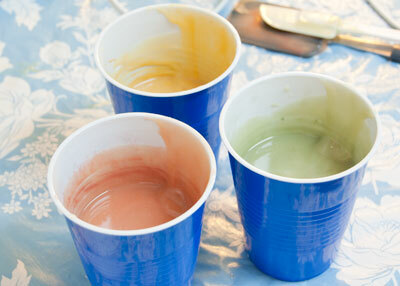 Begin by preparing all of your additives and placing them in containers so they are ready when you need them. 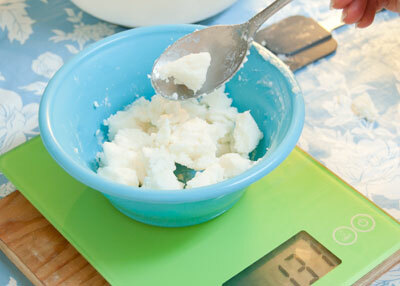 Measure out your hard oils and add them to your soap making bowl. 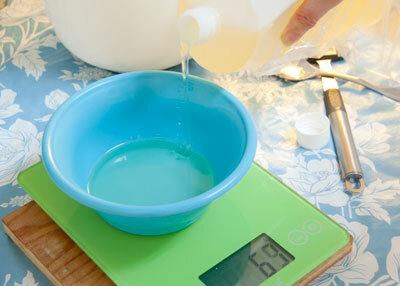 Then measure out your liquid oils and place them aside. Prepare the lye solution, stir it until the lye crystals have dissolved completely and then pour the lye solution over your hard oils. 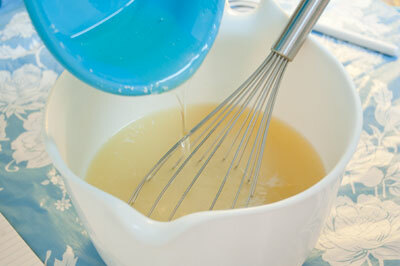 Gently stir the hard oil and lye solution until the hard oils have melted completely. 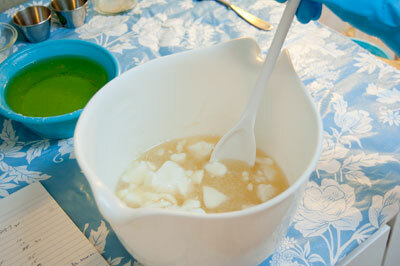 Pour the liquid oils into the soap batter and give the soap a bit of a stir. This time I also added the scent blend before using the stick blender. Dump in the Kaolin clay and stick blend until the soap batter reaches a thin trace. I divided off 1/2 the batch for white and the remainder into three cups which I then coloured with the copper mica, emerald mica and yellow oxide mica mix. Be sure to stick blend the colours in really well. You don't want to have little unmixed specks of colour show up in the final bars. 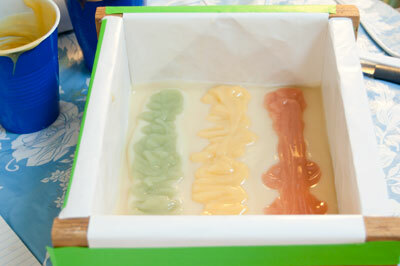 Half the white soap and a strip of each colour was then poured into the soap mould. I repeated the process, laying down white on top of the last layer and then the three colours, making sure that the colours where not in the same order as below. As you can see, the soap started to set up and I had to work a bit faster. 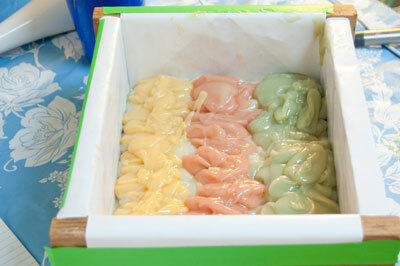 I gave the soap a quick jiggle in the mould to level it out. To create a marble pattern, I ran a bamboo skewer across the coloured strips and then up them. The soap looked a little boring to me so I added some white mica to the top. 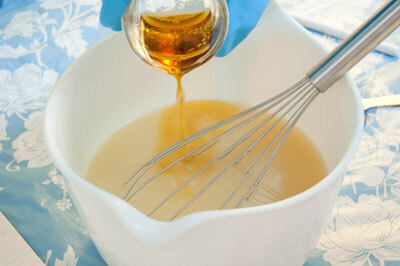 For this technique you drizzle the mica oil mixture over the soap base. Just little spots here and there. Go easy as a little goes a long way. Using the bamboo skewer again, I ran it through the white dots creating a nice marble effect. The soap was then wrapped up until it reached a full gel and once it had cooled, I cut it into fun little square bars. Now it's your turn to give this mango butter soap recipe a try!